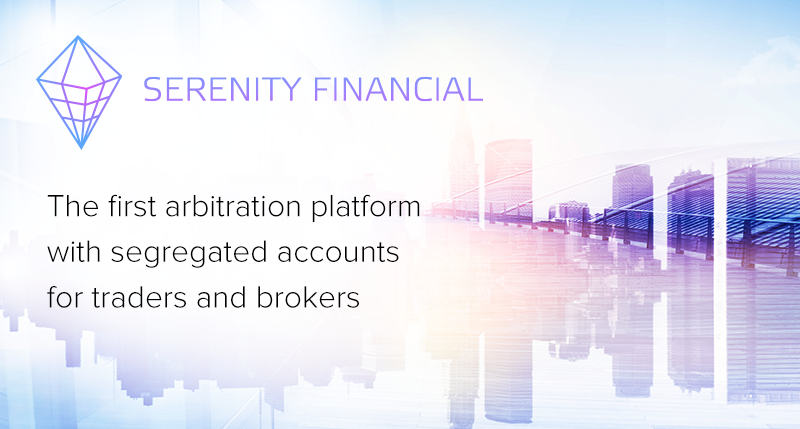 Meet Serenity Financial — the first blockchain-based arbitration platform for Forex market! Meet Serenity Financial — the first blockchain-based arbitration platform for Forex market! A revolution is coming for those who trade Forex or Binary Options. Serenity Financial is the first marketplace for brokers and traders based on Ethereum blockchain. Marketplace is a platform that processes all transactions between brokers and traders. All trading and non-trading transactions are recorded in blockchain, which guarantees transparency and eliminates the possibility of forgery. The platform stores clients’ funds and acts as an arbitrator in disputes, guarantees security and return of funds. Why is our project relevant? Trading volumes of today’s Forex market reach billions of dollars. Thousands of brokers serve as intermediaries for millions of traders around the globe, while only 10% of these brokers are regulated. The market is practically on its own — no standards, no evaluation criteria, no transparency or guarantees. Even choosing a broker is a huge gamble for a trader. The project acts as a marketplace. A trader registers with Serenity, connects to any certified broker from the pool, purchases tokens and transfers them to the broker that then provides the trader with an equivalent amount in the account currency. Trader starts placing trades while their funds remain on Serenity accounts and all trades and transactions are recorded in blockchain. When the trader closes a trade, they can submit a claim to our arbitration committee if they suspect any interference from the broker. All trades are recorded in blockchain, thus the arbitration committee can always review the trading terminal data and establish irrefutable evidence whether the trade was executed correctly. If it was not, Serenity obliges the broker to reimburse the client. Everything is 100% transparent. First, Serenity Platform will be integrated with major trading platforms MetaTrader 4 and MetaTrader 5 and then with other trading platforms. The team behind Serenity Financial has already launched several successful projects: Grand Capital Forex broker with monthly turnover of $4,7M and a brokerage software provider UpTrader. Why are we sure that Serenity will reinvent the Forex industry? We are creating an environment where all participants feel completely protected. Brokers will get liquidity easily and on favorable terms, as well as guarantee transparency for traders and thus attract additional funds. Let’s change the Forex industry together! Pre-ICO starts as early as 15th of November. Join us!